Hot Air Balloon Ride provided by Bill, Maple Ridge owner. In my mind today, I'm thinking about bucket lists. Face it. We all have a timeline. I've learned that life is for living and spreading love. This past weekend, I was able to check off one of my bucket list items: Hot Air Balloon Ride! It was amazing and even more beautiful because I could share it with my Grands. It was made possible by the smartest and sweetest podiatrist ever, Dr. Kelly Walker of Walker Foot(no pun intended but isn't that so cool?) 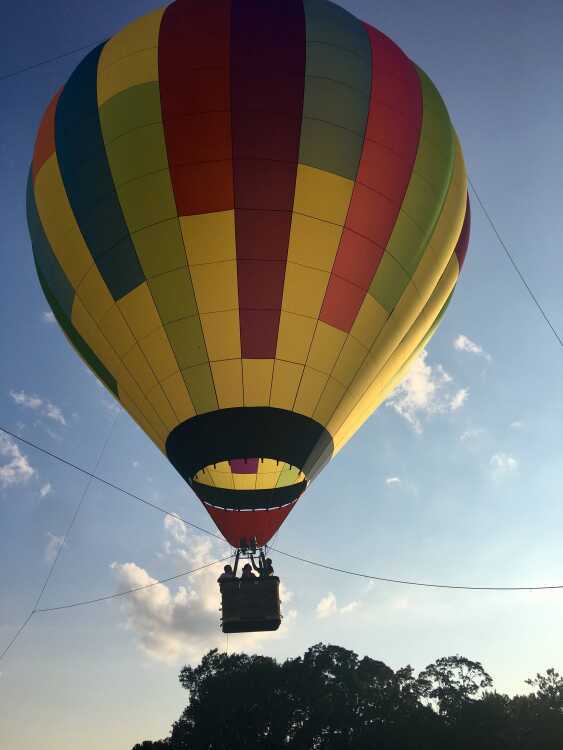 She and Maple Ridge retirement facility gave not only me but other disabled and assisted living people a "lift" through High Jinx's hot air balloon rides out of Memphis, Tennessee. See how God works through love and people. As I look and revisit my bucket list, I know with ALS some will be literal miracles to complete like visiting Machu Picchu, Rome, and France. But hey, that's okay. As a former teacher, I learned to monitor and adjust to help students be successful. So to live and accomplish some of my bucket list makes me giddy. Having a grateful heart with love and humility has been a gift to me from ALS. It's made my perspective so much sunnier. How? When friends whisk me away on little day trips or my husband has to feed me because I'm so tired or my sons use the cough assist and suction to clear my weakened lungs or my Grands light up when they see me despite my chair or my daughter and son's fiancé have to bathe me or holding friends newborn animals or watching my great nieces and great nephews swim in my pool, or my nieces and nephews garden, clean, or just visit me and hug me, when children want to talk to me and take rides on my scoot or former students stop me to talk when they see me, all of these things make my heart swell with joy and love. They shape my spirit and soul. I've learned to be so grateful for all things big and small through Christ's example. So, it's another day and I have race work to do along with living. Yes, you guessed it. I'm grateful. Students today's assignment is to pen your own bucket list. I know it's hard when you are in the middle of working to provide for your families, but just think of three things you would like to do or see in your lifetime. That's the first step to making it happen. The clock is ticking! "Life is a One Time Offer. Use it Well." "Sometimes our only mode of transportation is a Leap of Faith." Bill Ables is a WONDERFUL administrator at Maple Ridge. Very professional at what he does.